Since the summer of 2009, the Anglo-Saxonist community has been abuzz over what its keepers are calling “the largest Anglo-Saxon treasure hoard ever found,” the so-called Staffordshire hoard. Comprised of over 3,500 items of gold, silver, and gems, the hoard is one of the most exciting discoveries of the past century. Here’s what you need to know. When, and by whom, was it found and excavated? The hoard was found in July 2009 by metal detectorist Terry Herbert, and reported to Britain’s Portable Antiquities Scheme, a program set up for amateur archaeological finds to be reported to the government. The dig was conducted July-September 2009 by archaeologists from the Staffordshire County Council and the University of Birmingham. Archaeologists working on the hoard have yet to confirm when the objects themselves date to, although they estimate that they were made from the sixth to the eighth centuries. When the hoard itself was collected and buried is therefore even harder to determine. This is unclear. There are no graves surrounding it, making it unlikely that it was part of a burial. Other suggestions are that it was a royal treasury, some kind of tribute, or perhaps a treasure hidden in the face of a threat. 3,940 mostly gold and silver items, which seem to be of mostly martial character (sword buckles, etc. ), according to the website. the craftsmanship is consummate. This was the very best that the Anglo-Saxon metalworkers could do, and they were very good. Tiny garnets were cut to shape and set in a mass of cells to give a rich, glowing effect, that is stunning. Its origins are clearly the very highest levels of Anglo-Saxon aristocracy or royalty. It belonged to the elite. They note that many of the pieces seem to have been torn off of larger items they were part of (like pommels being torn/broken off from their blades), suggesting that they might be the spoils of war. Whether that was one spectacular battle, or the result of years’ worth of collecting, has yet to be determined. It was valued at £3.285 million. This find is located in what would have been the Anglo-Saxon kingdom of Mercia, one of the most powerful kingdoms in England until the ninth century (so this hoard was probably gathered near its zenith). It managed to subdue some of the most powerful Anglo-Saxon kingdoms of its day – Northumbria in the North and Wessex in the south of England, and waged somewhat succesful campaigns, both military and political, against and at times with the surrounding British (i.e. pre-Anglo-Saxon Celtic) peoples. More specifically, material culture can tells us about the kinds of cultural contacts that a region had, whether through trade or physical contact with foreigners, since we can often tell where a piece was manufactured, based on the materials used and style of decoration. This, in turn, can tell us about the place England held in the Europe of the day. Many foreign-made objects implies close ties with the continent, and comparing the artistic styles of the objects can show how closely related English fashions were to continental ones. As the hoard researchers suggest, the sheer abundance of incredibly well executed artwork can also help shed new light on the art of the period, and, potentially, force us to “rethink seventh century metalwork”. The physical evidence of the objects, such as their wear-and-tear or remnants of other materials on them, organic or not, can tell us about how they were used and, in turn, can help us better understand Anglo-Saxon practices. Most exciting are the sheer numbers. The larger the number of objects historians, art historians, and archaeologists have to work with, the more accurate their findings. 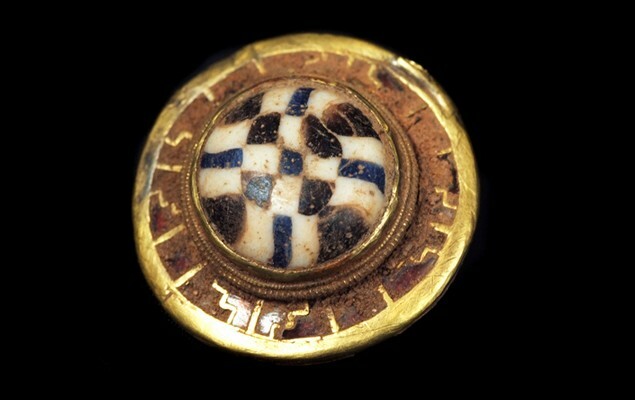 This entry was posted in Anglo-Saxon/Old English, Archaeology, Art and tagged 7th century, 8th century, archaeology, art, battle, british, cross, finds, garnet, gold, hilt, hoard, inscription, mercia, metalwork, new research, spoils, staffordshire, wales, war, zoomorphic. Bookmark the permalink. In the biblical inscription, I must confess I do not see the ‘et’ between ‘domine’ and ‘disepentur’. Not that I know anything about AS inscriptions – how is it abbreviated? I don’t see one either, unless you count the arrow-like mark between the two, which could be a tyronian note (a punctuation mark that looks like a “7”, and is basically a medieval version of an “&”), but looks more like a scratch. I’m guessing the “et” is understood, or supplied from Numbers 10:35, which this inscription is from. In his article in Notes & Queries (http://nq.oxfordjournals.org.myaccess.library.utoronto.ca/content/58/1/1.full) Brandon Hawk puts the “et” here in square brackets, suggesting that it is just editorial. Given that on the other side ‘et’ is written as an ampersand-like ligature, it’s probably omitted here; maybe the scratch is a Tironian note which was added later.